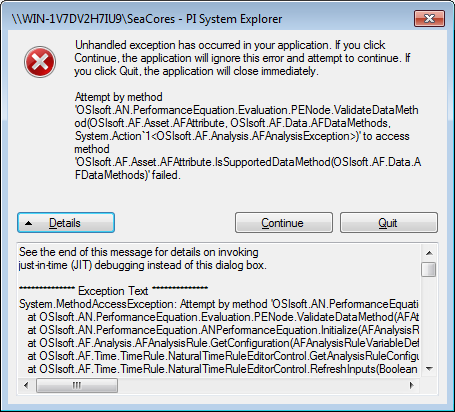 Exception/error whenever AF Analysis viewed/calculated. This doesn't happen using the AF client on the main machine, that calculates values fine. However, if I ever access it over the network the calculated attributes fail with this exception etc. System.MethodAccessException: Attempt by method 'OSIsoft.AN.PerformanceEquation.Evaluation.PENode.ValidateDataMethod(OSIsoft.AF.Asset.AFAttribute, OSIsoft.AF.Data.AFDataMethods, System.Action`1<OSIsoft.AF.Analysis.AFAnalysisException>)' to access method 'OSIsoft.AF.Asset.AFAttribute.IsSupportedDataMethod(OSIsoft.AF.Data.AFDataMethods)' failed. Re: Exception/error whenever AF Analysis viewed/calculated. These types of crashes can be tricky to pinpoint. Have you tried running a repair on AF Explorer? You say that this is only happening on one machine. Can you give us the versions of AF Explorer on the problem machine and compare that agains the versions on one of the machines that is working fine. I presume when you say when it is calculated, you mean via the Evaluate button? This has been reported for the scenario where you have a 2.7.5 or older AF Client and 2.8.5 Analysis Service (2016 R2), however I'm not seeing a public link for the issue. The workaround is to upgrade your AF Client to 2016 R2. Thanks a lot, updating AF Client solved the issue. Small correction to what Mike Zboray said, you should upgrade your AF Client to 2016 R2 SP1. PI AF Client 2016 R2 was pulled because of a Known Issue.